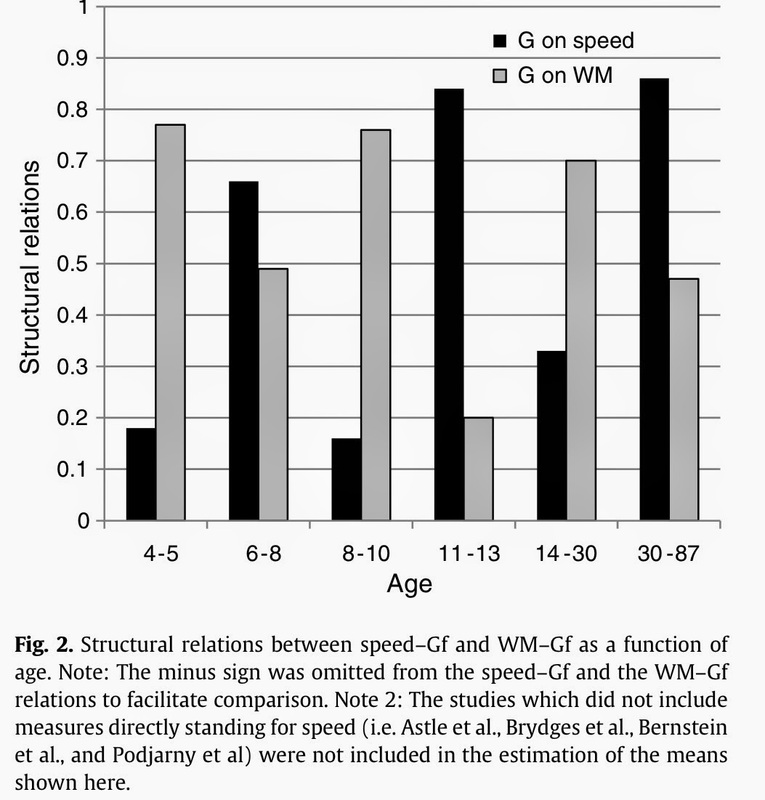 Very interesting research that suggests a developmental (neo-Piagetian) wrinkle to the developmental cascade model, a model that has shown that Gs influences working memory (Gwm), and working memory in turn influences Gf (but Gs has no direct influencee on Gf). "However, the exact role of speed and working memory is still debated. Some researchers emphasize speed as a purer index of the quality of information processing in the brain (e.g., Jensen, 1998). 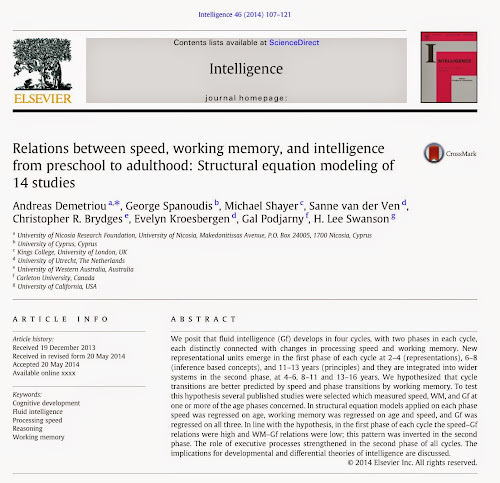 This interpretation is based on studies which estimate the relation between speed and intelligence without involving working memory. Others emphasize working memory because it is the workspace of thinking (Kyllonen & Christal, 1990). 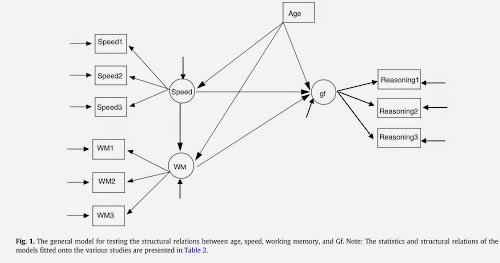 Studies emphasizing working memory usually measure all three constructs in young adults, when working memory is the dominant predictor of Gf, according to the patterns to be described below. 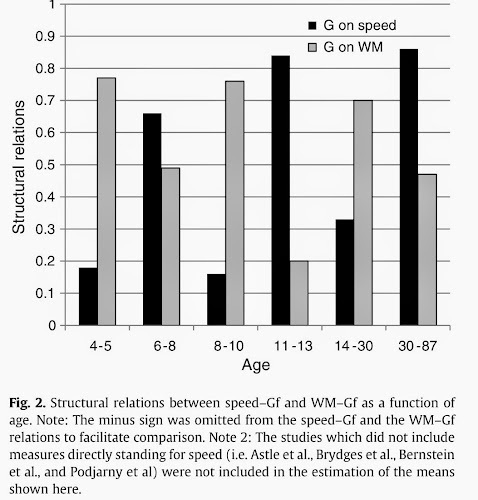 Finally, others assume a causal linear relation between them such that changes in speed cause changes (or differences) in working memory which, in turn, cause changes (or differences) in Gf (Case, 1985; Coyle, Pillow, Snyder, & Kochunov, 2011; Kail, 1991; Kail & Ferrer, 2007). 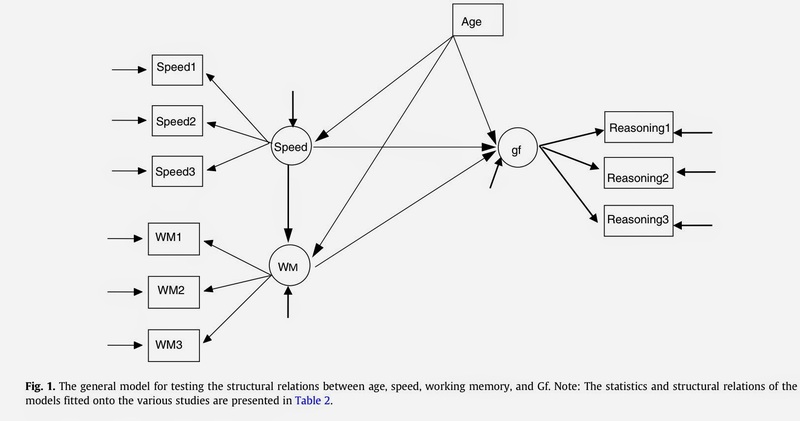 However, this chain of relations may only reflect the fact that working memory tasks are both timed, like speed tasks, and require information management, like Gf tasks, rather than a causal sequence. In fact, there is evidence that control of attention is common to all, speed, WM, and Gf, explaining their relations (Cowan, Morey, Chen, & Bunting, 2007; Engle et al., 1999; Stankov & Roberts, 1997)"
Note. Attentional control (AC) is now proposed to represent a narrow ability under the broad CHC domain of Gwm (short-term working memory) by the authors of the forthcoming WJ IV [Conflict of interest disclosure--I am one of the coauthors of the WJ III and WJ IV). This is consistent with Schneider and McGrew's (2012) recent book chapter CHC model update. "Demetriou et al. (2013) showed recently that the relations between these constructs are more complicated than originally assumed, because they vary with growth. Specifically, speed increases and WM expands. Gf evolves along a reconceptuali-zation sequence (ReConceP) where changes in the nature of representations alternate with changes in the command and interlinking of representations constructed earlier." 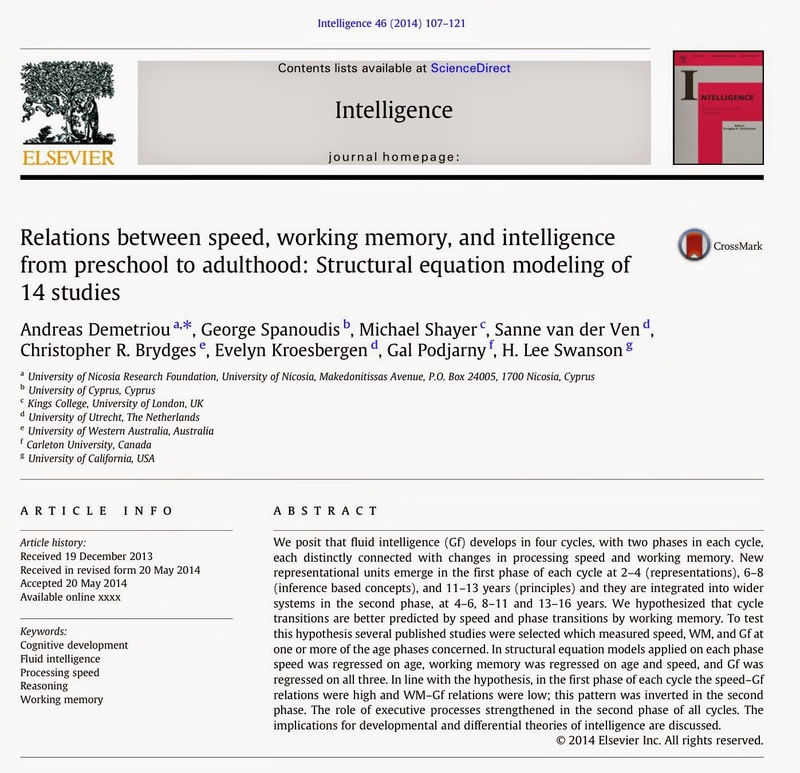 "These patterns provide support for an integrated developmental–differential theory of intelligence that would explicate why Gf changes coalesce with speed at the beginning of developmental cycles and with WM changes at the end. Gf undergoes three types of change: representational, inferential, and complexity." I previously presented (McGrew, 2005) support for the developmental cascade model in 5 age-differentiated WJ III norm samples (see one of the sample models below). 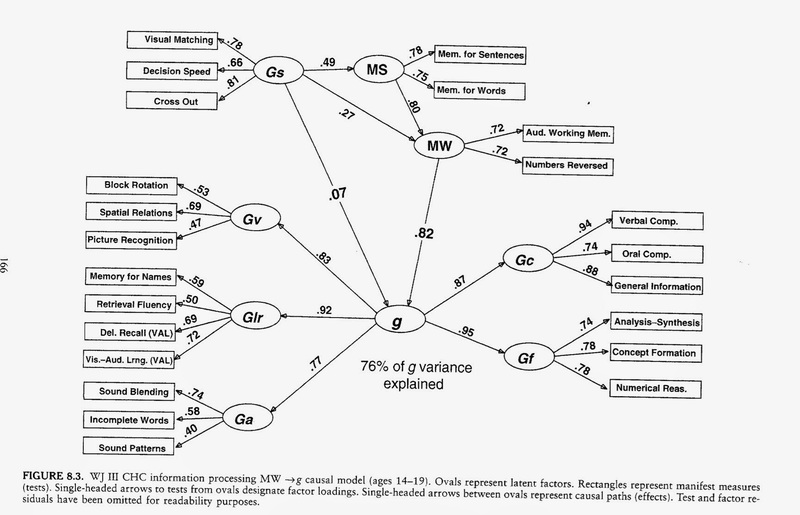 Instead of causal models with Gf as the criterion, I specified a criterion g-factor defined by Gv, Ga, Glr, Gf, and Gc. 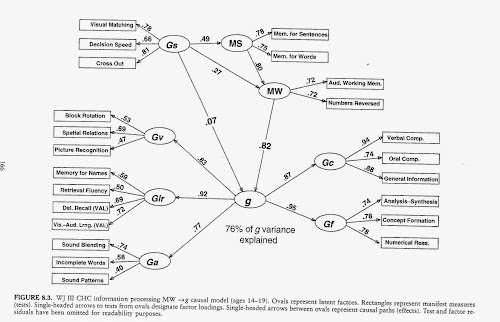 The results strongly supported the Gwm->g link, and significant causal links from Gs to working memory. Gs did not dispaly a direct link to g in the childhood samples, but did demonstrate small significant direct paths to g in the adolescent and adult samples.